A BUBBLING CAULDRON: Fish Fry Is Here - And It Has Moved! OK, Costa Mesans and all the rest of you who read this feeble effort to inform the populace - it's that time of the year again. 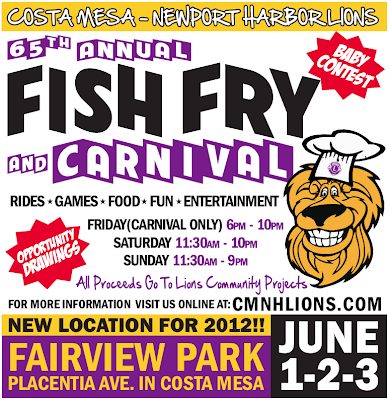 The 65th annual Costa Mesa- Newport Harbor Lions Fish Fry is upon us. After decades at Lions Park, this year the Fish Fry has moved to Fairview Park and, for the first time, a beer and wine garden will be part of the festivities. As you can see form the flier below, it's bigger and better than ever. (Click on the image to enlarge it) So, plan your weekend around this kick-off to summer event. This year you'll be able to view the beautiful Pacific Ocean from the top of the Ferris Wheel! See you there. 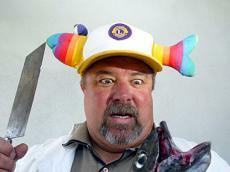 My 10 member family was forced to bypass the Costa Mesa Fish Fry this year. It was simply inaccessible to too many of us. The 1 - 2 mile hike from the parking area to Fairview Park makes that venue impossible for the very old, very young, infirm and handicapped to attend. What a shame, and worse yet, what a waste. 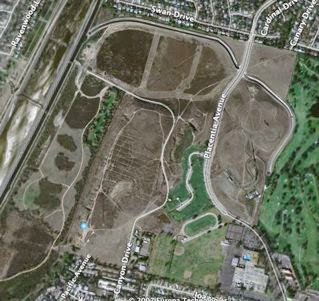 What were the planners thinking? Better yet, --- were they even thinking? The Fish Fry should NEVER have been moved from Lion's Park. If damage to the grass because of the carnival is an issue, simply drop the carnival. The Fish Fry is enough of a draw (and it's the primary reason people attend anyway). As a taxpayer, I'm also concerned about the city getting sued should anyone stumble over a curb again, get hit by a car while crossing Placentia, or otherwise injured in the process of trying to attend the event. Furthermore, to remove the Lion's Park shade shed to cure the homeless problem is somewhat akin to removing all banks to cure our bank robbing problem. What's wrong with removing the problem instead of the taxpayer assets? Better yet, what's wrong with Costa Mesa's loitering law that it won't permit vagrants to be forcibly removed from our city parks? It appears to me that the tail is clearly wagging the dog in Costa Mesa now!! !